A 30 minute trek of the heart of Honolulu and East Oahu, departing from Ko Olina on the West Side of Oahu. Departing from the exclusive West Oahu resort area, Ko Olina, this 30 minute tour highlights the best of Oahu's past and present along the southeast coastline. A string-of-pearls full of stunning sights: Picturesque Honolulu Harbor, graced by the renowned Aloha Tower; downtown Honolulu and Iolani Palace, the only royal palace in America; heart-tugging Punchbowl, the National Memorial Cemetery of the Pacific; Magic Island, Ala Moana Beach Park, the legendary vistas of Waikiki Beach and Diamond Head, and the unforgettable emotion of Pearl Harbor and the Arizona Memorial. 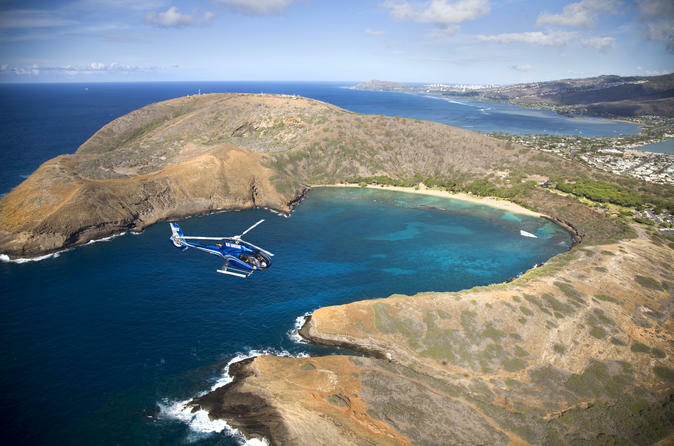 This is the perfect choice for those that haven't been on a helicopter tour.